Looking for a delicious recipe that is cheap and low in calories? Here is a great recipe I got from eMeals . It serves 6 people, has a total cost of $17.26 (or $2.88/serving). 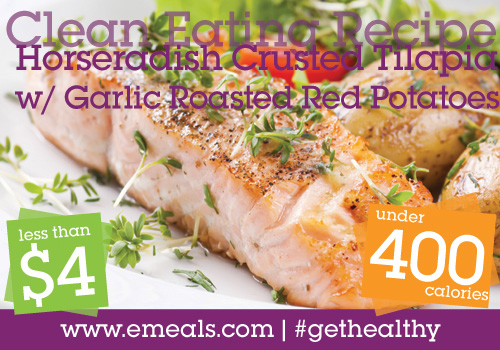 This recipe is part of their series of recipes under 400 calories per serving and under $4 per serving. Awesome, right? Last year I wrote about my experience with eMeals, and I am still using it! You should check it out…save money, make meal planning and grocery shopping easier. In a small bowl, combine mayonnaise, Parmesan cheese, lemon juice, Dijon mustard, and horseradish. Spread mixture evenly over both sides of tilapia filets, and coat lightly with breadcrumbs. Heat butter in a skillet, and cook fish over medium heat 4 minutes per side, or until browned and fish flakes easily with a fork. Toss potatoes with olive oil, garlic, salt and pepper. Bake on a rimmed baking sheet for 45 minutes, stirring once halfway through cooking time. Sounds so good, right? Well it is… just try it! Awesome! Let me know if you try it, Erica! I love horseradish but have never had it with fish. I'm definitely going to have to try this! I love making tilapia. This recipe looks really delicious. My husband and I were just talking the other night about how we want to make some fish this week. This looks delish! I struggle with serving enough fish dishes, but this looks doable and VERY affordable! This sounds so awesome!! I think I have some horseradish. I just need the tilapia. This does sound yummy though! Can't wait to try it. I am more of a veggie and fish eater and I love your recipe. I also love tilapia, and prefers cooking it fresh. I already tried with it horse radish minus the red potato, but would love to try it. My husband will LOVE this! He is a fan of any and everything with horseradish in it. It will definitely be our next "fish dish". Thanks for the great idea! You're welcome, Krista! Let me know how it goes if you make it!